Republicans were elated after their party took full control of Congress in the 2014 midterms. But that mood quickly turned to disappointment, and Republicans’ frustration with House Speaker John Boehner and other GOP leaders has risen sharply this year. Now, Boehner has become the latest casualty. After years of trying to manage his rebellious GOP caucus, Boehner announced Friday he will be resigning as speaker and giving up his House seat at the end of October. The resignation comes as Boehner has been trying to avert a partial government shutdown on Oct. 1 – an effort that put him at odds with conservatives who are opposed to any funding bill that doesn’t cut off Planned Parenthood. His decision to resign could give him a freer hand to push the measure through. Many Americans were unfamiliar with Boehner when he took over as speaker shortly after Republicans won a majority in the House in December 2010. At that time, 28% viewed him favorably and 25% unfavorably, while nearly half (47%) had no opinion of the Ohi0 Republican. As Boehner’s visibility grew, his image turned more negative. In October 2013, shortly before the last government shutdown, 27% viewed him favorably and 50% had an unfavorable impression. By March of this year, those opinions had shown little change: Just 22% had a favorable opinion of him while 51% viewed him unfavorably. Before this year, however, Boehner had at least been seen more positively than negatively within his own party. But last December, just a few weeks after the GOP’s sweeping congressional victory, Republicans and Republican-leaning independents were divided (37% favorable, 36% unfavorable). And in late March, for the first time in his five-year tenure as speaker, more Republicans and GOP leaners viewed him unfavorably (43% than favorably (34%). 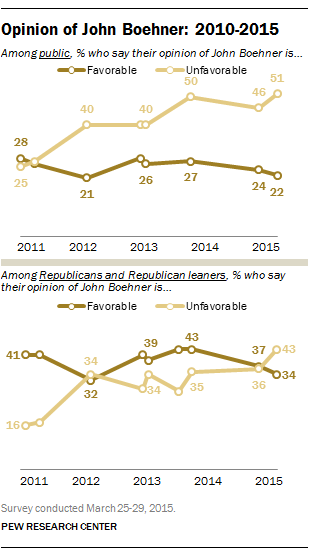 Tea Party Republicans’ views of Boehner, in particular, became much more negative between December and March. In December, opinion of Boehner was divided among Republicans and leaners who agree with the Tea Party (45% favorable, 43% unfavorable). In March, unfavorable impressions outnumbered favorable views by 15 percentage points (52% to 37%). However, Boehner has not been alone in drawing the ire of Republicans. Our survey in May found general dissatisfaction among Republicans with the new GOP-led Congress and its leaders. 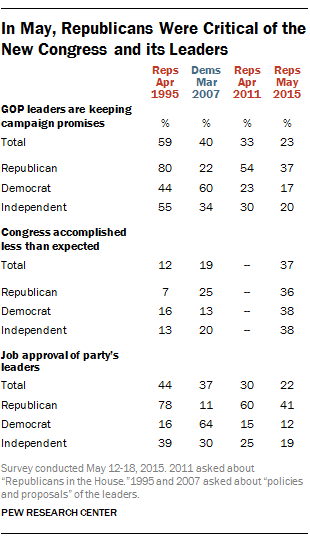 Just 37% of Republicans said GOP leaders were keeping campaign promises, far below the percentages of Republicans who expressed that view following GOP congressional victories in 2010 (54%) and 1994 (80%). And just 41% approved of the job performance of GOP leaders, down from 60% and 78%, respectively, after those victories. The source of Republicans’ frustration was clear: Most wanted Republican congressional leaders to take a more confrontational stance toward congressional Democrats and President Barack Obama. 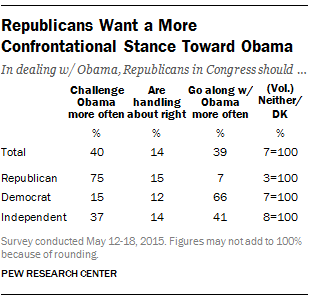 In May, 75% of Republicans said they wanted Republicans in Congress to challenge Obama more often. Only 15% said they were handling relations with Obama about right, while just 7% favored a more conciliatory approach toward the Obama administration.